Unusual Surface Texture in Luidia ciliaris! Unknown natural history or ??? GREETINGS! and Happy New Year! Yes. Sorry. Its been awhile since I've blogged.. Lots of travelling and research are a good thing...but time for essential outreach can sometimes be fleeting! For my inaugural 2018 post: a MYSTERY! I've written about the genus Luidia before.. these are predatory sand stars which are found all around the world. They can vary in appearance and in some places they are very abundant.. Most species are shallow and occur in temperate tropical habitats. 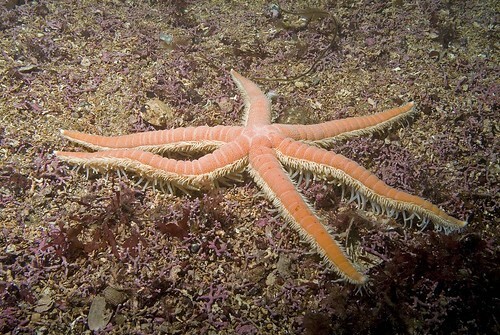 Although many species are five rayed.. some such as L. ciliaris can have seven or more arms. Some species in the tropical Indo-Pacific have very striking patterns and can reach almost 2 feet in diameter! 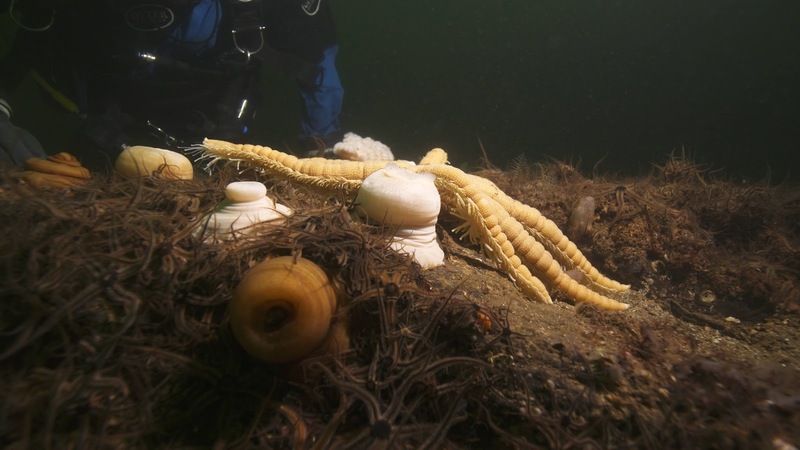 Luidia ciliaris is found pretty much only in the North Atlantic although it has likely close-relatives in nearby areas. This species is regularly seen by divers in the United Kingdom, France, Spain and etc..
Today.. Andy Jackson, an underwater photographer grabbed this wonderful time lapse video of the North Atlantic 7 armed sea star Luidia ciliaris IN ACTION! Doing a move through this field of brittle stars! 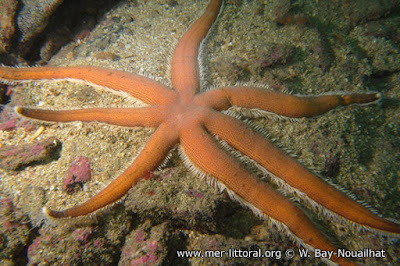 seven armed starfish with banding - Luidia ciliaris from Andy Jackson on Vimeo. Interestingly, he noticed that THIS one had a VERY unusual banding or strange segmentation on the arms! He came to me with the question.. WHAT IS the BANDING??? That strange surface texture that is visible on the surface of the animal??? You see it in headlines a lot...but I will actually say it "Scientist (in this case-ME) was baffled!!" Here is a normal one again for comparison.. the top surface is even.. NOT with the strange surface segments present along the arms..
1. Is this a "normal" part of this species' behavior?? Something which we have simply never seen before? 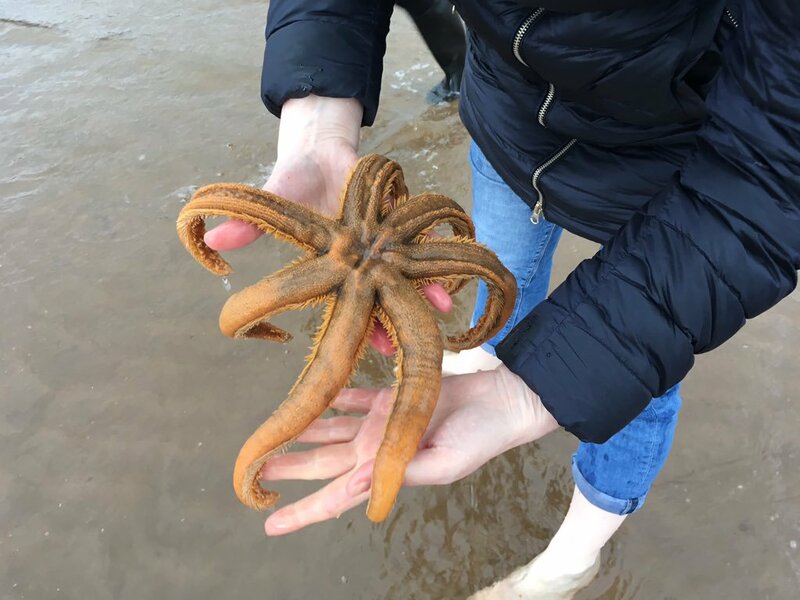 One might see from Andy's video that the animal was in the process of moving through a field of brittle stars..could the odd surface texture have been caused as a defense? from irritation? stress? This is why "Natural History" becomes important! and how citizen scientsts, including everyone from divers to intertidal naturalists have something to contribute! So, I am putting this OUT THERE to let people be aware of it.. and who knows? Perhaps a pathologist, natural historian, ecologist and more? Might take up an interest... More data and MORE OBSERVATIONS could well help us figure out if this is something to be concerned about..